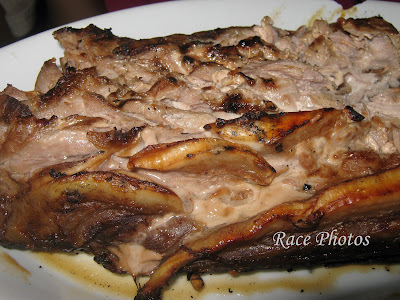 This is one of my favorite dishes, Pork Liempo or Pork Belly whatever you want to call it and I want it grilled or fried. Grilled is less sinful I guess lol! This one is a little bit different from what I used to cook in the house. I mean the cut is different as I used to grill rectangular shape liempo. This one is from Aling Tonyang's Seaside Resto. Anyway the taste is still the same succulent taste of yummy grilled pork belly. I love it on special occasions like New Year's Eve and birthdays spent on resorts. How to marinate pork belly before grilling? Just mix soy sauce, lemon or calamansi juice, salt, pepper, garlic and oyster sauce. Some add catsup in the marinade sauce but I don't use it if I already have oyster sauce. Marinate for 3 hours to overnight then the pork will be ready for grilling. The sauce used for marinating can be mixed with little catsup and cooking oil to use for spreading the pork while grilling. hayyy, sarap...just finished lunch and this looks so yummy! sarap isawsaw sa toyo na may calamansi, :) happy food trip friday! the problem with grilled liempo is, iniihaw pa lang, lahat ng nakakaamoy gusto ng kumain! LOL nape-pressure ang nag-iihaw! sus, sarap nito sawsawan with maraming onions, kamatis garlic and chili and kalamansi.. drooling na hehehe..